The use of modeling tools for creating and managing requirements and process models of systems. Repeating the procedure for creating the project database in CASE system PD. Initial steps for adding of main analytic and design models. Preview of the main models in example UnivLib (Univerzity Library Information System). Business Process Model (BPM) can be used to design the decomposition and choreography of tasks at a business level. It can be used for modeling existing system and new system too. Combination of BPM and Requirement Model (RegM) can help understand existing system and requirements to new system. 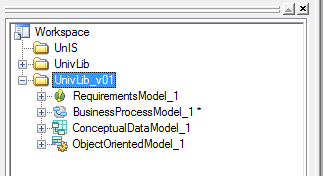 New folder in project database is suitable to use for each project in project database. For this can be used folders in PD. Task: Create new folder for the new project: MouseRBclick-Workspace/New/Folder UnivLib. There are many possibilities for use models and modeling in software life cycle. Selecting suitable combination of model depends on many things (complexity of analysed and target system, properties of system, project and development environment,...) In process of analysis of existing system and formulation of requirements to new system can be used Requirement Model and Business Process Model. Conceptual Data Model (CDM) can by used for recognizing of important data entities and relations between them. Object Oriented Model (OOM) based on UML can be used for analysis of existing system and for design and implementation of new system. Task: Create new main models for project UnivLib. 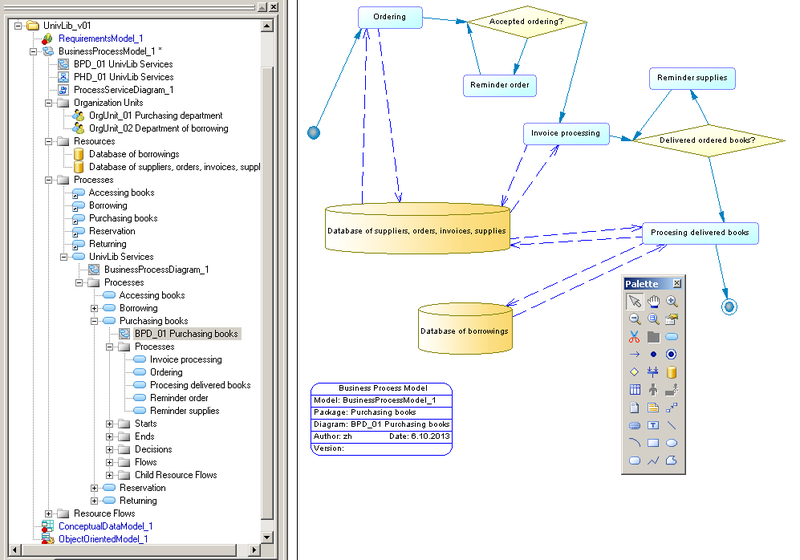 Adding Requirements Model (ReqM) into the project UnivLib: MouseRBclick-UnivLib/New/RequirementsModel. ReqM can consist from Requirements Document View, Traceability Matrix View, User Allocation Matrix View. 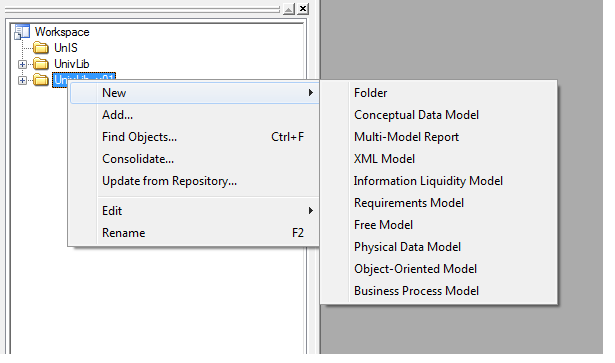 As a first representation for ReqM select the document (Requirements Document View). This form will be used for creating of list of requirement. Task: Add new ReqM into the project UnivLib. 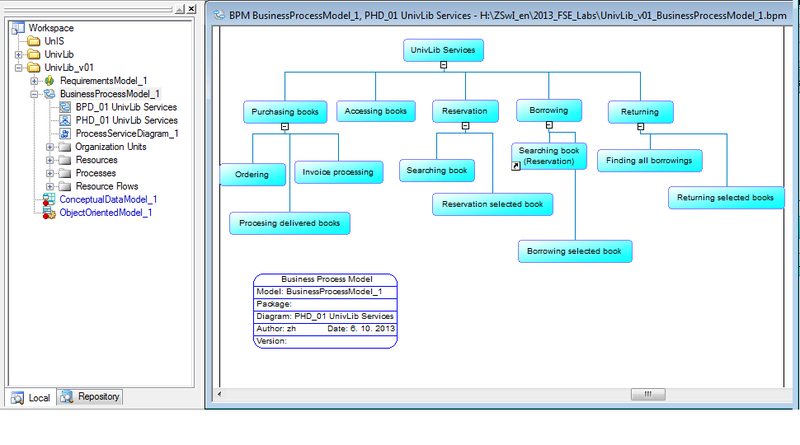 Adding Business Process Model (BPM) into the project UnivLib: MouseRBclick-UnivLib/New/Business Process Model. As a first representation of the business process model select hierarchy process diagram. Task: Add new BPM into the project UnivLib. Adding Process Hierarchy Diagram (PHD) into BPM into the project UnivLib: MouseRBclick-UnivLib/Business Process Model / New / Process Hierarchy Diagram. Task: Add new PHD into BPM in the project UnivLib. Filling the list of requirements - the first iteration of the list of requirements will include a brief title requirements and detailed description (all necessary important details can be replenished iteratively and incrementally). Processing of requirements is incremental and iterative process. Task: Create initial documnet view of ReqM in UnivLib example with description of these main requirements: Purchasing of books with use of existing database of supliers. Services for processing of orders and invoices for purchasing of books. Service for reservation of books by registered users of library. Service for borrowing of books by registered users of library. Service for returning borrowed books. Storing information about registered users of library. Registering of user of library. Process hierarchy diagram (PHD) is model of the hierarchy of processes (services). We use gradual decomposition process of UnivLib root (which represents the entire system UnivLib) to child processes (services) on the lower level of decomposition and to atomic tasks (elementary, further nedekomponované processes, services, functions). Decomposition in the tree diagram can be applied to existing nodes. Not-root node diagram can have multiple parent nodes. 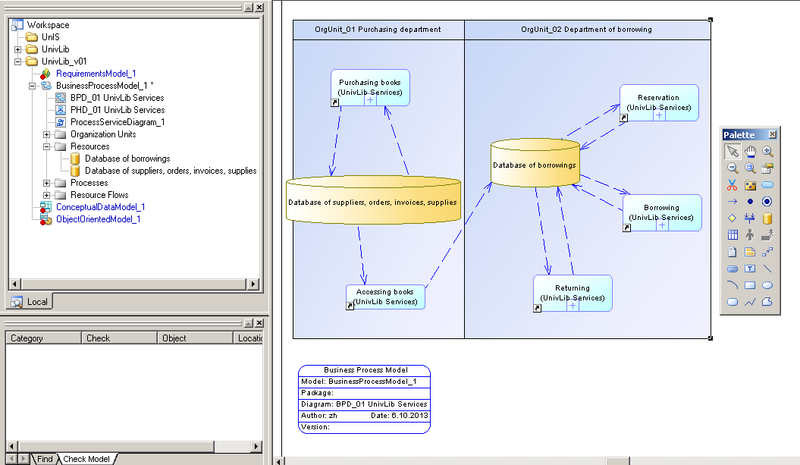 Diagram can include in addition to processes (tasks) also packages and files, which can be connected by an edge of dependency to the root node of PHD. Drawing of new business process diagram (BPD) for modeling of business processes in the project UnivLib: MouseRBclick-UnivLib/Business Process Model / New / Business Process Diagram. Drawing up a diagram business processes - flows (Flow / Resource Flow) between tasks (Process) and resources (Resource). It is possible to include in the diagram, processes (tasks) created previously in PHD (moving from browser). Moreover, it is possible to add other new processes, resources and data stores (resources), nodes start and end of implementation processes (tasks), decision nodes (Decisions), synchronization nodes (synchronizations), organizational unit (organization units, swimlines). Additionally you can add packages (packages) and files (files) that can be connected with oriented edge of dependence (Link / Extended dependency) with all type of nodes in this graph. Task: Draw new business process diagram (BPD) for overview modeling of business processes in University Library Information System in the project UnivLib. In next diagram is example of decomposition of process of purchasing new books. Task: Start to work and consult Your semestral project - create initial requirement model and business process model. Use examples from UnivLib project. Task: Draw new business process diagrams for other decomposed processes in the project UnivLib. Task: Prepare presentation of initial requirement model and business process model of Your semestral project for next laboratory work Lab04.